I am a true New Year cliche since life is all about being healthier right now. I’m measuring my steps with a Fitbit, juicing anything that moves and decluttering anything within eyesight. 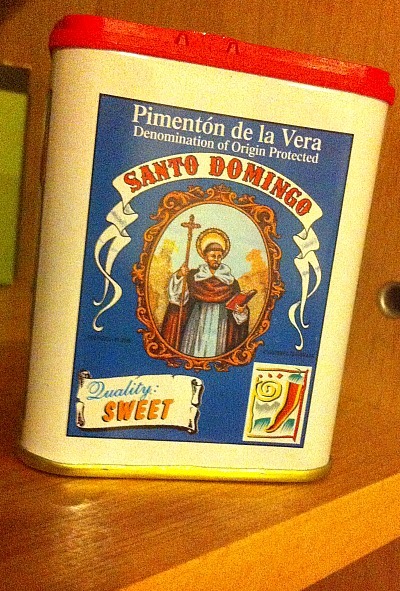 Yes it looks like a holy relic but it’s actually a tin of smoked paprika which I picked up in Marks and Spencer of all places. 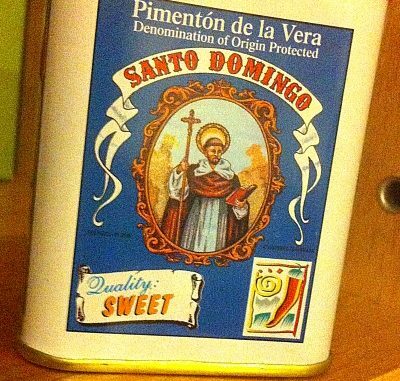 I had no idea what I was going to do with it, I just liked the tin. Then as luck would have it I was approached by Sunrise who have developed a series of healthy recipes including one that utilizes smoked paprika. You can download the original PDF of the Smoked Paprika & Red Onion Chicken recipe here. As we are a mainly veggie family I have adapted this to make it vegetarian. Preheat oven to 180C/fan 160C/gas mark 4. Heat the oil and sauté half of the onions with the sage. Continue until the onions are golden brown. Add the wine and simmer until reduced by half (doesn’t take long), then add the stock and simmer for a further 10 minutes. Thicken with the gravy granules and simmer for a further 5 minutes (keep stirring as it goes very thick). Season to taste – I didn’t add any salt as gravy granules and stock cubes are salty enough for me already. In a separate pan, heat the olive oil and seal the chicken breasts/Quorn fillets. This is where it starts to get fiddly because you have two pans on the go, but it’s doable as long as no children enter the room and start waffling about nothing. Turn the Quorn/chicken until evenly cooked, then set aside. Add the second half of the onions and smoked paprika to the pan and sauté until soft. 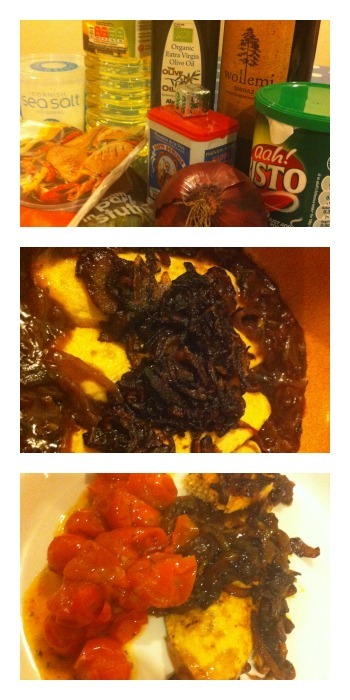 Place the chicken/Quorn on a lightly oiled oven dish, then top with the onions. Pour the gravy mix around the chicken and bake for 20-25 minutes. As Quorn can be quite dry, I baked it with foil over the top but you might not need to do this with chicken (says the clueless non-meat cooker). If you’re also cooking cherry tomatoes, put them into the oven at the same time covered in a little olive oil and Italian herbs if you have any. Turned out really nicely! And the weirdest part is that the Child Least Likely to Eat Anything Spicy actually asked to try this and polished off a whole plate of it. Wonders will never cease. This recipe is one of a series created by Sunrise assisted living, who have a team of award winning chefs who create delicious and nutritious recipes which are perfect for a healthier New Year.